When you’re outdoors, knowing the time is an integral part of being prepared for any situation. Without any knowledge of the time, you won’t know when to meet up with your group at the rendezvous point, when the sun is going to set, or how long you have been out in the elements. Having an accurate and reliable way to tell time is crucial to basic survival. That is why many of those who spend time outdoors turn to a high-quality military or tactical watch in order to keep track of the time. These specialized watches sometimes include a compass function, miniature light, and many other features. When picking a tactical watch, think about what you will be doing and then find one that suits your needs. Buying one before assessing your needs will result in a waste of money. There are a variety of military-style watches on the market today, so it shouldn’t be difficult to find the perfect one to fit your lifestyle and level of activity. This article will cover the important criteria, as well as options and features to consider when shopping for a tactical watch. So to save you the time and effort, we have researched some of the top military watches on the market. You should be equipped with all the information to make the right purchase after browsing through our product reviews. As mentioned above, everyone has a different hierarchy of needs and priorities, so what one buyer considers an important feature in a military grade watch, may not be the same for others. So you will need to assemble a list of features that you want in your tactical timepiece. The first thing to look for in a military watch is its toughness and durability. The last thing you want is for it to break after taking a minor hit or a splash of water. No one likes to worry about their watch breaking, especially if they paid hundreds of dollars for it. A person should be able to strap the watch to their wrist and go without any worries. Therefore, when reading through the reviews, make sure you consider the quality of the product. One of the key elements that make for a tough watch is a durable face. A cracked face is a sure way to stop even the toughest watches, so look for models that use scratch-resistant materials for the window. This is often a feature closely associated with its price, so you can expect military watches with a higher price point to be more durable than cheaper models. Even if you don’t plan on going underwater, the wild can be very unpredictable. A tactical watch should have a moderate level of waterproof capability, so you won’t have to worry about protecting it in the rain or if you dip it into a lake or river. Also, if you are planning on doing some diving, you will need to make sure your rugged watch is rated for the depths that you will be reaching. Some are rated to go down as far as 650 feet or more, so you won’t have to worry about the case being compromised at greater depths. Yes, a tactical watch must be heavy-duty, but that doesn’t mean it can’t be comfortable, too. Look for a band that isn’t going to cause a rash around your wrist or cause discomfort. One with high quality should stay in place and not slide around your wrist or up your arm. Consider the reviews about the product’s comfortability level prior to purchasing. One last thing to consider is the size of the tactical watch’s face. Some offer giant faces (which also take up a lot of space on your arm) while others are compact and lightweight. There isn’t a ‘right or wrong’ size face, but be sure that you are picking one that meets your activity level and needs. A benefit of owning one is it gives you the ability to tell time in the most difficult of conditions, such as cold and wet nights out in the wild. No matter what you are doing in the field, you will want to be able to tell time at a moment’s notice in order to make smart decisions. Is the sun about to go down, or do you have another hour of sunlight? It may be hard to tell depending on the weather and where you are located, but your watch can give you the answer in just a fraction of a second. Another benefit is the variety of activities that it can be used for. Going on an overnight backpacking trip? These types are a perfect companion. Heading out diving, or kayaking, or even whitewater rafting? A waterproof military watch is a smart accessory to have. Once you own one, you’ll be surprised at how versatile and useful they actually are. You might even wear it outside of your excursions and more during your everyday life. For a full-featured tactical watch that can take care of just about any task that you could ask for a timepiece, this Casio model is up to the job. This is shock resistant, which is water resistant up to 200 meters. It includes a stopwatch which goes down to 1/1000th of a second, along with a full auto-calendar. It has proven to be worth it for many buyers. One of the first benefits mentioned by owners actually doesn’t have anything to do with performance – but rather the aesthetics of the Casio GA100-1A1. The dark black matte finish is appreciated by many, as it can look sharp in a number of settings. 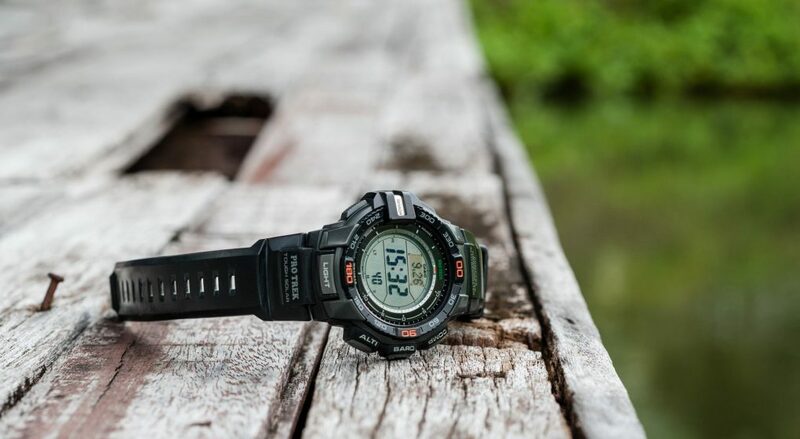 As you would expect with a Casio watch, the reviewers are complimentary of the durability, as it can take a beating and keep on working with no loss of performance. The only minor complaint about this product seems to be the fact that the face doesn’t illuminate bright enough for some users after dark. So, if you are going to be regularly using your watch in the dark, that would be one point to consider. However, on the whole, this is rated as a quality product with more than a few supporters to sing its praises. Right off the bat, you will notice a dramatic difference between this watch and the first option on our list as this model has a stainless steel look as opposed to the matte black finish above. This product looks like it means business, with the stainless steel case and hefty size that it offers. There is both an analog and digital readout on the face, so you can get the time quickly no matter how you prefer to take in the information. It has precision Japanese quartz movement on the inside, and there is a stopwatch along with a backlight and alarm. It is hard to imagine that you could be looking for too many features in a tactical watch that aren’t included in this product. The strap is rubber, and there is anti-scratch glass which protects the face of the watch. Buyers state that this product is a good value for the money and that it does everything which is claims to do. While it is obviously not a high-end product like you would find at significantly higher prices, this product gets the job done without breaking your bank account at the same time. 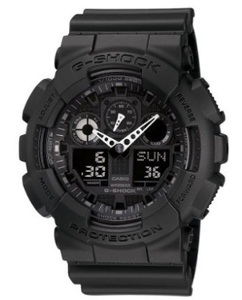 Another Casio product, this is the most expensive watch at this point on our list. And there are several reasons why. The Casio G-Schok Rangement was designed right from the start with the purpose of being able to take a beating in the field. 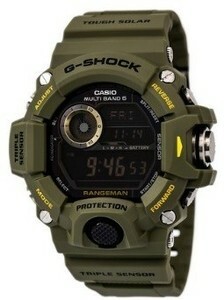 It has atomic timekeeping; it uses tough solar power, is shock resistant, and includes a tripe sensor. That triple sensor means you can access an abundance of information including altitude, barometer readings, and temperature. If you are going to invest a couple of hundred dollars, you want to make sure it is up to the challenges that you are going to throw its way. In that respect, the Casio Rangeman is a model you can count on. Reviewers have put this item through its paces in a variety of conditions and the vast majority report that it was able to handle whatever they threw its way. In addition to durable performance, the looks of this model have been complimented by plenty of wearers. It has been given great reviews by some who are in the military, and others who simply use it for everyday wear in the outdoors or even around town. While it will take a little bit of investment to own this watch, it is one that is meant to last and impress all along the way. Along with Casio, Suunto is another watch name that you should know you can rely on for durability and performance. This is a well-respected brand in the business, and this product lives up to the expectations that many have for this watch maker. 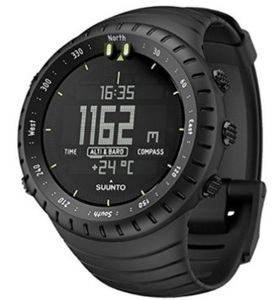 The Suunto Core is aluminum which uses a digital time display, is water resistant up to 30 meters, and offers a number of other functions such as altitude, barometer, compass, and more. There are a number of different specific models within the Core Military Watch line, and you can pick from a variety of colors and price points. Reviewers often use the words ‘great’ and ‘excellent’ when referring to this product, and some have complimented the accuracy of the ABC readings (altimeter, barometer, compass). When compared to other ABC watch options, many users feel that the Suunto Core is the most accurate choice. Also, other reviewers have noted that this product seems to have no problem putting up with water exposure, which is important if you are going to be spending extended periods of time out in the elements. With great looks, color options, and a range of price points, the Suunto Core line of military watches is one to consider closely. The last option on our list comes in with a very moderate price tag. That makes this Timex worth consideration right off the top, as it stands to save you a significant amount of money from some of our other options. Of course, you aren’t going to get as many various features as are offered on the more expensive options, but the Expedition Shock XL can provide ample information for the average outdoor enthusiast. Unless you are taking part in some serious outdoor adventure, there is a good chance that this Timex is all you need. Getting down to the details of this product, it includes an acrylic dial window, the case is made from stainless steel, and the band is rubber. It is rated for up to 660 feet of water resistance, and it includes both an alarm and a calendar. Reviewers appreciate the durability of this model, as well as the vibrating alarm feature. For the price, this product is a great way to get into the tactical watch world without making too much of an initial investment. This tactical watch from Timex comes high in quality and durable, especially for the price. The item features a rugged, yet attractive casing and resin strap make this item a popular Timex piece. The watch is a little on the chunky side, which can sometimes be difficult if you’re trying to fit it under a long sleeve shirt. Also, keep in mind that the dark gray wristband fits a wrist size of up to 8-inches in circumference. This Timex watch features 2 time zones, a 24-Hour Chronograph with 1/100-second resolution, and provides either 24-hour military time or am/pm. It reads both digital and analog, so there’s no confusion of what it is while you’re out in the field. It tracks the month and day and allows you to set the alarm. The dial illuminates, and so do the analog hands, which makes this military-grade watch ideal for reading time at night or in the dark. This watch definitely checks all the boxes, when it comes to a tactical watch. The black negative digital display can be troublesome to read for some. Lastly, the watch is shock and water-resistant but is not meant to be submerged for long periods, like diving. This NAVIFORCE military watch is the perfect blend of tactical and casual. This multifunction tactical watch is water-resistant (30m), but not suitable for swimming or diving. Its large, luminous face makes it easy to read the time and date, especially in the dark. The watch is entirely analog and does not feature a digital clock. Also, the watch has a cool design and flawless quality, especially for the price. This piece of tactical gear uses Japanese original quartz movement to deliver precise and accurate time. The strap is made of genuine leather and secures with pin buckle. The leather band can be a little stiff at first, but you’ll notice the leather to begin to soften as you wear it more. Or to expedite the process, we suggest applying a little bit of mink oil. The combination of the alloy case and scratch resistant glass, make this watch shock-resistant and durable. This NAVIFORCE military grade watch is simple to set-up and use and provides excellent quality at a solid price. This watch is the epitome of military grade. This GPW (German Precision Watches) tactical watch was designed by and for soldiers of the German Crisis Reaction Forces. The case is made of Grade 2 titanium and weighs in at 2 oz. (without the band). That makes this tactical watch the #1 most lightweight military watch available on the market. The sapphire crystal combined with the anti-reflection coating makes the face of this watch scratch-resistant. GPW’s titanium watch is sleek, simple, and accurate. Its Swiss Quartz movement make this watch reliable. Also, the analog hands illuminate for readability when it is dark out in the field. This item provides you with the day and date, and to follow another time zone simultaneously, merely turn the bezel to match the hour hand with that of the other time zone. This tactical watch is also water resistant up to 660 feet. For peace of mind, all GPW wrist watches come with a 2-year warranty. 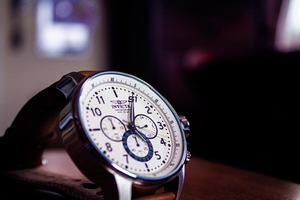 The company sells and services its watches directly. You will definitely not be disappointed by this product. This watch is officially licensed by America’s very own US Marine Corp. Besides the price, there are tons of things to like about this watch. It’s robust, reliable, stylish, and has much more. The chronograph features a sleek camo dial that reads both digital and analog. For accuracy, the watch uses Quartz movement. For nighttime hunting and stealth missions, the timepiece has an EL backlight and its hour and minute markers have luminous accents. Some other essential features include a stopwatch, alarm, calendar, and countdown timer. This tactical watch is water-resistant up to 165ft, but not meant for snorkeling or diving. The military grade watch secures with a comfortable rubber strap. No matter the conditions, you can rely on this watch to guide you through it. Even better, this watch comes with a 2-year warranty and a portion of every purchase goes straight to the U.S. military. It’s a win-win, so give this watch a shot. We promise you won’t regret it. The Garmin Instinct is the perfect tactical watch for the outdoors. Take this watch with you on your most rugged excursions so you’ll never be lost. This tactical watch meets military standard 810G, which means it is thermal, shock, and waterproof (100m). Also, it features a scratch-resistant display, so you’ll never have to worry about blemishing its face. Some other vital tools it possesses are a heart-rate monitor and GPS/GLONASS navigation system. The Tracback function is probably one of the more helpful tools, which traces your route back to base camp. The product’s backlight makes it easy to see at night. Depending on which mode you’re using, the battery life can range anywhere from 16 hours to 14 days. But never fear, this bundle includes not only a multipurpose retractable microfiber towel but also a PlayBetter 2200mAh portable charger. The portable charger provides 2 full charges, so there’s no need to ever worry about running out of battery during the most critical times on your hike. It has various sports modes to help you track your physical training. This piece of equipment is definitely one of the best tactical-grade watches on our list. Military/Tactical watches come in a variety of shapes, sizes, looks, and more. You can’t really lump all the watches in this category into one pile because there is so much variety among them. As this shows, you can find one for an affordable price, or you can easily spend hundreds if you would like more features and capabilities. It may take a little bit of searching and research, but you should be able to settle on a great choice in the near future.